If you’re heard the name Anthony Bourdain only ecently, chances are that you know him from his popular show on the Travel Channel, No Reservations, where he travels the world seeking to sample local cuisine and culture. As a fan of No Reservations, I’ve come to see ‘Tony’ as one of the rare unpretentious, down-to-earth type of people that would be fun to kick around with. An excellent character as a travel show host and television personality… But would you believe it… I didn’t even know this man was a true-to-life chef and author. As luck has it, I recently discovered that Tony Bourdain is quite the accomplished writer. And thus, I recently picked up and finished his first book, Kitchen Confidential: Adventures in the Culinary Underbelly, Bourdain’s personal memoir which was released in 2000 and continues to be on the New York Times Bestseller List. 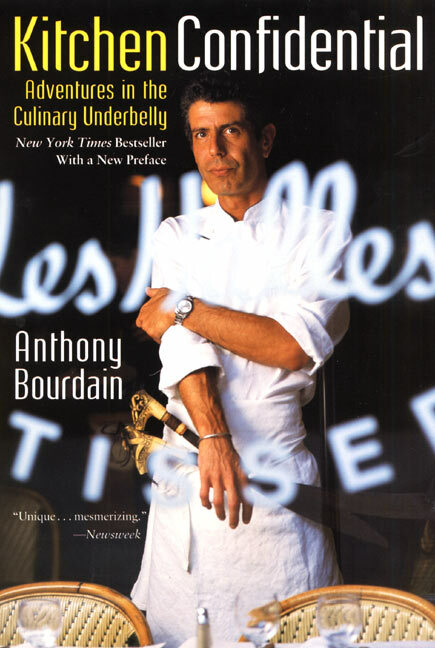 In Kitchen Confidential, Tony Bourdain takes readers through a behind-the-scenes look at the restaurant business from the perspective of someone on the inside – and subsequently sharing the entirety of his professional journey from bottom-of-the-totem-pole dishwasher to executive Chef along the way. As you would probably guess from watching Tony on television, Kitchen Confidential is as engaging, witty, and undeniably entertaining as you think it’s be. While foodies may shudder at his description of restaurant life, it is admirable that Tony does not pull any punches in his portrayal of life in commercial kitchens and the “wacked-out moral degenerates, dope fiends, refugees, a thuggish assortment of drunks, sneak thieves, sluts, and psychopaths” who make their living serving up your fine dining. From the intricacies of restaurant lingo to what it’s like for a line cook during a Friday night rush, Kitchen Confidential truly is a graphic account of the intricacies that make up the restaurant trade. Having worked in the restaurant trade all the way through college, I would highly recommend this book as a must-read to everyone who has ever worked in the restaurant business or anyone else curious about what is behind that stuff you’re ordering. And in case you still won’t pick up the book, here are some of Kitchen Confidential’s tips for diners. Never order fish on a Monday. The best nights for dining out are Tuesday through Thursday. Be wary of Sunday brunches.